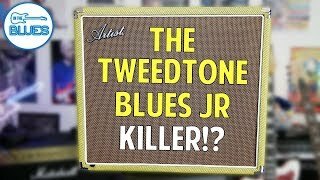 The Artist Tweedtone20R amplifier provides tonnes British Tube-driven, vintage-voiced tone at an affordable price. This amp has 2 channels, clean and overdrive. There is a Footswitch jack underneath the back of the amp to switch between channels. Footswitch is not included. Both channels independent volume controls, and there is a master volume control which adjusts the overall volume of the amplifier. So you can really drive the clean channel hard to get that nice warm overdrive 'breakup' at levels that won't annoy your neighbours. Switching to the Overdrive channel provides a thicker, creamier overdrive for harmonically-rich blues and rock tones. The 3-band EQ is highly responsive and allows for a vast array of tones to suit your personal preferences. This amp is loaded with a high-performance Celestion Seventy 80 12 inch speaker for excellent all-round performance and tone. INPUT - Connection to the instrument. CLEAN VOLUME - Sets the volume of the Clean channel. DRIVE BUTTON - Manually switch between the Clean and Drive channels. 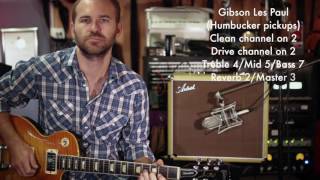 DRIVE GAIN - Sets the amount of gain or distortion in the overdrive channel. DRIVE VOLUME - Sets the volume of the Drive channel. TREBLE - Adjusts the high-frequency equalization range as required. MIDDLE - Gives active midrange equalization with boost & cut. BASS - Adjusts the low-frequency equalization range as required. MASTER VOLUME - Adjusts the overall volume of either the Clean. or 'Drive' channels. MASTER REVERB - Adjusts the amount of reverb added to the normal signal. FOOTSWITCH INPUT - Underneath the back of the amp. Footswitch not included. STANDBY SWITCH - Switches the amp in/out of standby power mode. Wait until 30 seconds after the power switch is turned on to prolong your tube life. POWER SWITCH - Main amplifier ON & OFF. Had a problem with short ship on my order but they immediately corrected it. Thanks.